The CRC's Guide to Best Practice for Safer Construction continues to receive interest and endorsement in Australia and overseas. Associate Professor Helen Lingard from RMIT's Property Construction and Project Management School, delivered a workshop on international developments in safety and worker engagement for senior executives of CRC partner Arup in Hong Kong recently. Dr Lingard and her RMIT colleagues were part of a Construction Innovation research team, including representatives from QUT and Curtin University of Technology �who participated in the Safer Construction project, undertaken in association with Engineers Australia. 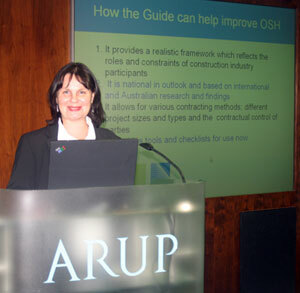 The landmark Guide to Best Practice for Safer Construction document was developed with significant cross-industry input. It reviews Australian and international best practice initiatives and delivers a framework aimed at improving safety performance in construction that covers all stages of a project: planning, design, construction and post-construction. Dr Lingard co-presented the 'International developments in design for safety and worker engagement' workshop to approximately 15 Directors and Associate Directors of Arup Hong Kong with Dr Billy Hare of Glasgow Caledonian University. “I presented the Guide to Best Practice for Safer Construction and explained the implications of its content for key stakeholder groups, including clients, designers and constructors,” Dr Lingard said. The workshop was requested by Arup, as the company felt this Australian initiative was appropriate for their senior management group in Hong Kong. A similar public workshop was also held at the Hong Kong Foreign Correspondents' Club and was attended by representatives of a number of different construction contractors, as well as government representatives. Dr Lingard said feedback about the Safer Construction component of the research was very well received. “Design safety is a big issue overseas and there is considerable interest in Construction Innovation's Safer Construction framework,” she said.